On Friday 2 October, Formation Zone will host open auditions for a new online TV channel. On Friday 2 October, Formation Zone will host open auditions for a new online TV channel. The new channel, being launched in partnership with Cornwall Innovation, aims to inspire young people to become entrepreneurs. Together with MPAD and Pixel Rain we are looking for presenters and vloggers to help bring the channel to life. This is an exciting opportunity to become part of an innovative and collaborative project and will look great on anyone’s CV! The auditions are being held on Plymouth University campus in the Formation Zone on Level 2 of the Marine Building. Auditions are open to anyone between the ages of 16 and 26. 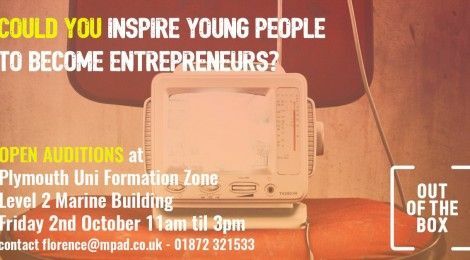 If you think you’ve got what it takes to inspire the next generation of entrepreneurs, or if you think you’d be a great presenter, contact florence@mpad.co.uk or call (01872) 321533 for more details.